Last month I took the plunge and had lip fillers by our Nurse Emma! I’m not scared of needles as some people are, although I didn’t really know what to expect from this treatment. I wanted to have lip fillers to give my lips a little bit more volume and to give them a smoother appearance. Emma is so professional and calming, anyone that is scared of this treatment needn’t be in the hands of Emma! She applies numbing cream for 20 minutes prior to the treatment – this is such a weird feeling. 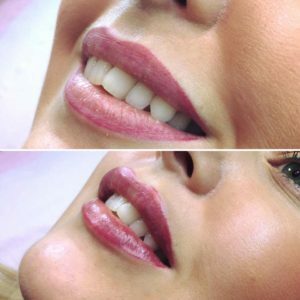 I have had semi permanent makeup on my lips so i wasn’t new to have a needle in the lips, although this was quite a different experience. I didn’t find having the fillers painful, it was a little bit scratchy in parts but I found it fine! Everyone obviously has different pain thresholds but I really didn’t think it was bad at all, Emma uses the most expensive thinnest needles on the market, this makes the treatment much more comfortable for the clients. It is an instant result! Your lips are full and plump, Emma then massages them and applies arnica cream to reduce any bruising that may occur. The lips do swell for the first few days leaving them fuller then desired but they then settle down. I really like my new lips, applying lipstick is lovely as they feel so smooth and I’ve had less chapped lips! Book in with Emma for a consultation and she can answer any questions you may have, and can let you know all about the treatments she offers! Emma also offers, anti wrinkle Botox injections, facial dermal fillers and HYPERHYDROSIS which is in the armpits for excessive sweating. Emma is currently working from her home clinic offering procedures in a specially built chalet style clinic room which is so lovely. There are beautiful countryside views and FREE parking! She will be back in the salon with us this summer. Please quote The beauty boutique when booking. Check out @countrysidecosmetics on instagram for a video clip of me having my lips done and lots of other client pictures! Here’s a picture of my lips before and after the treatment. EFFECTIVELY, RESULTS CAN BE EXTREMELY SATISFYING FOR THE CLIENT. A CONSULTATION FEE OF £50 IS REQUIRED AT THE POINT OF BOOKING. THIS WILL BE DEDUCTED FROM YOUR TOTAL BILL AFTER YOUR TREATMENT. WRINKLES BY FILLING BOTH FINE LINES AND DEEP FOLDS. LOOK DEPENDING ON THE TREATMENT AND TREATMENT AREA. BODY, MAKING THEM A POPULAR AESTHETIC TREATMENT TO HAVE. ARRAY OF DIFFERENT TECHNIQUES TO PROVIDE THE DESIRED EFFECT. ENSURE THAT YOUR EXPECTATIONS ARE MET ON THE DAY. TO ENSURE YOU ACHIEVE THE BEST POSSIBLE RESULTS. BEFORE YOUR TREATMENT TO MINIMISE ANY DISCOMFORT. MICRO-FINE NEEDLE TO MINIMISE ANY DISCOMFORT. TO SURGICAL INTEVENTIONS FOR PROBLEM CORRECTIONS. OF THE ASSOCIATED ANATOMY INVOLVED IN THESE TREATMENTS.